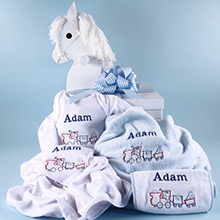 This beautiful baby gift offers the best of two worlds! 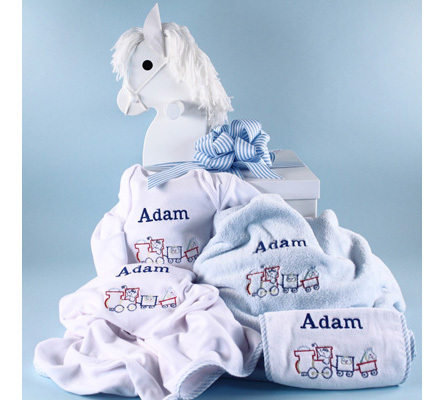 Each layette item included in this essential "home from the hospital" collection comes personalized with baby's name plus your choice of an adorable embroidery design. 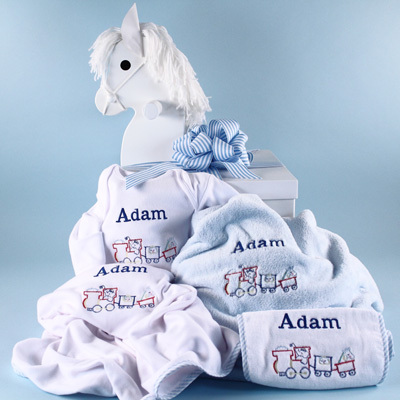 And because this is one of our signature Create Your Own gifts, you also get to choose name embroidery thread color, font, garment trim color and even the ribbon that wraps the stunning rocking horse gift box your gift will be packaged in. Gift includes: 100% cotton interlock sleep gown w/name & choice of design 100% cotton interlock 2-ply receiving blanket w/name & choice of design Incredibly soft & cuddly "milky fabric" baby blanket w/name & choice of design 100% cotton terry velour burp pad w/name & choice of design Signature Rocking Horse top gift box w/choice of of ribbon Please note that this gift will be custom made and personalized to your specifications. Make sure the information provided is correct as we cannot be held responsible for data submission errors. No returns, exchanges or credits will be issued on custom made merchandise unless we are responsible for a mistake. Please allow 5-7 days for manufacturing.